All you wonderful women out there-step out this women’s day with your favorite Bandar tee and grin like a mischievous monkey! Also, watch these enjoyable Monkey videos and do a little chimp dance! 1) When one of the most popular faces on Youtube interviewed the most popular female crusader for chimps, stuff was bound to go bananas! Our monkey-caps are off to this woman, who has surpassed every man in her domain. 2) Unbelievable Marina Chapman is a Columbian born who claims she was raised by monkeys. We don’t doubt her, but you’re free to form your own opinion after watching this. 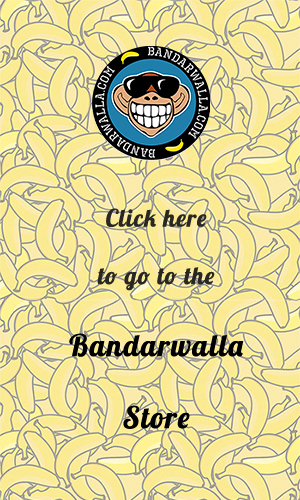 3) For the next video, we would rather keep both bandar hands tightly on our mouths and simply let you watch this. 4) Does something in your primal nature get a kick out of watching a bad monkaay? Jukin Videos should satisfy craving that with this hilarious compilation. 5) Let’s quit monkeying around for a bit and refocus, what day is it again? This amazing BBC short clip shows you why our ancestors live up to generation old stereotyping from a scientific angle. 6) If you found the last video fascinating, you’d totally love this Nat Geo clip. Funny how women in modern day society deal with similar issues, even up till now. 7) “All’s well that ends well”, and this beautiful moment of a girl playing with her newfound friend is certainly “Aww” material, so here you go, Internet!